The Slim incorporates a CASIO developed and patent pending Hybrid Light Source which combines Laser and LED technology for amazing high brightness and can last up to 20,000 hours. The Slim is an earth-friendly, low maintenance, 5 pound projector with features such as a 2X Power Zoom Lens making it a great portable projector. 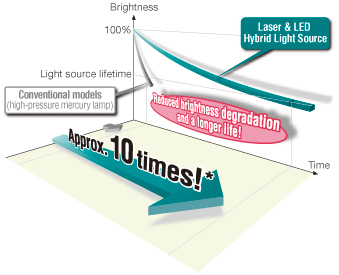 The Slim Projector eliminates the need for a short life mercury lamp (typically 3000 hours) and is economical to operate. 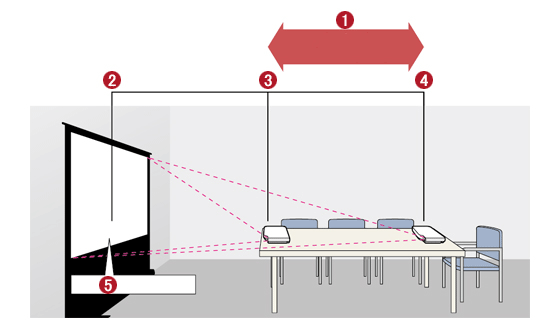 An optional mount enables users to attach the projector securely to the ceiling. * Its lightweight, compact design, matched to the shape of the main projector unit, is tastefully unobtrusive, ensuring that the projector blends in with conference room and classroom facilities and decor. *When suspended from the ceiling, the projector vertically inverts the images for projection. Wireless available for select models XJ-A257, XJ-A247, XJ-A147 only. *App functions and operating environments may be altered without prior notice. *The app may not function on some smart devices. Connect the calculator to a data projector and project the calculator screen. For more information, please check here.